Mahmoudinezhad, M., Ghoreishi, M., Mirzazadeh, A., Ghodratnama, A. (2014). An inventory model for non-instantaneous deteriorating items with imperfect quality, delay in payments and time value money. Journal of Industrial Engineering and Management Studies, 1(1), 58-71. M. Mahmoudinezhad; M. Ghoreishi; A. Mirzazadeh; A. Ghodratnama. "An inventory model for non-instantaneous deteriorating items with imperfect quality, delay in payments and time value money". 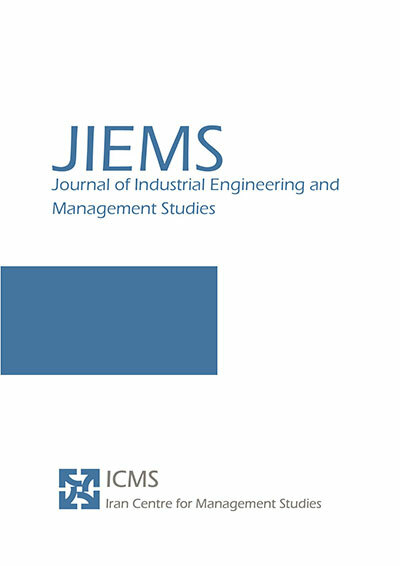 Journal of Industrial Engineering and Management Studies, 1, 1, 2014, 58-71. Mahmoudinezhad, M., Ghoreishi, M., Mirzazadeh, A., Ghodratnama, A. (2014). 'An inventory model for non-instantaneous deteriorating items with imperfect quality, delay in payments and time value money', Journal of Industrial Engineering and Management Studies, 1(1), pp. 58-71. Mahmoudinezhad, M., Ghoreishi, M., Mirzazadeh, A., Ghodratnama, A. An inventory model for non-instantaneous deteriorating items with imperfect quality, delay in payments and time value money. Journal of Industrial Engineering and Management Studies, 2014; 1(1): 58-71. In this paper, Economic Order Quantity ( ) based model for non-instantaneous deteriorating items with imperfect quality, permissible delay in payments and inflation is proposed. We adopt a time-dependent demand function. Also, the effects of time value of money are studied using the Discounted Cash Flow approach. Moreover, we assume that orders may contain a random proportion of defective items, which follow a known distribution and an inspection process is utilized to describe the defective proportion of the received lot. The mathematical model have been derived for obtaining the optimal number of cycle and the optimal inspection time so that the present value of total cost in a finite time horizon is minimized. An algorithm has been presented to find the optimal solution. Finally, numerical examples are provided to illustrate the solution procedure. Ghare P.M., Schrader G.H., A model for exponentially decaying inventory system, International Journal of Productions Research, 21: 449-460. Deb M., Chaudhuri K.S., 1986, An EOQ model for items with finite rate of production and variable rate of deterioration, Opsearch 23: 175-181. Chang, C.T., Ouyang, L.Y., Teng, J.T., 2003. An EOQ model for deteriorating items under supplier credits linked to ordering quantity. Applied Mathematical Modeling 27, 983–996. Wu K.-S., Ouyang L.-Y., Yang C.-Te., 2006, An optimal replenishment policy for non-instantaneous deteriorating items with stock-dependent demand and partial backlogging, International Journal of Production Economics 101 : 369-384. Yang C.T., Ouyang L.Y., Wu H.H., 2009, Retailers optimal pricing and ordering policies for non-instantaneous deteriorating items with price-dependent demand and partial backlogging, Mathematical Problems in Engineering 1-18. Nakhai K. I., Maihami R., 2011 “Joint pricing and inventory control for deteriorating items with partial backlogging,” International Journal of Industrial Engineering and Production Management, 21: 167–177. Das D., Kar MB., Roy A., Kar S., 2012, Two-warehouse production model for deteriorating inventory items with stock-dependent demand under inflation over a random planning horizon. Central European Journal of Operational Research, 20(2), 251-280. Uthavakumar, R., Rameswari, M. 2012. Economic order quantity for deteriorating items with time discounting. The International Journal of Advanced Manufacturing Technology, 58(5-8), 817-840. Shah N.H., Soni H.N., Patel K.A., 2013 Optimizing inventory and marketing policy for non-instantaneous deteriorating items with generalized type deterioration and holding cost rates. Omega 41:421–430. Mishra S.S., Singh P. K., 2013. Partial Backlogging EOQ Model for Queued Customers with Power Demand and Quadratic Deterioration: Computational Approach. American Journal of Operational Research, 3(2), 13-27. Shilpi P., Mahapatra G.S., Samanta G.P., 2014. An EPQ model of ramp type demand with Weibull deterioration under inflation and finite horizon in crisp and fuzzy environment. International Journal of Production Economics. 156: 159-166. Sicilia J., Rosa M., Acosta J., Pablo D., 2014, An inventory model for deteriorating items with shortages and time-varying demand. Journal of Industrial Engineering International. 9:4, 1-5. Buzacott J.A., 1975, Economic order quantities with inflation, Operational Research Quarterly. 26 553–558. Moon I, Lee S., 2000 The effects of inflation and time-value of money on an economic order quantity model with a random product life cycle. European Journal of Operational Research 125: 140–153. Chen J.M., 1998, An Inventory model for deteriorating items with time-proportional demand and shortages under inflation and time discounting, International Journal of production Economics. 55 21–30. Dey J.K., Kar S., Maiti M., 2004, An EOQ model with fuzzy lead time over a finite time horizon under inflation and time value of money, Tamsui Oxford Journal of Management Sciences 20: 57–77. Padmanavan G., Vrat P., 1990, Analysis of multi-item inventory systems under resource constraints; a non-linear goal programming approach, Engineering Costs and production Economics. 20 : 121–127. Hariga M., Ben-daya M.,1996, Optimal time-varying lot sizing models under inflationary conditions, Europian Journal of Operational Research, 89 : 313–325. Misra RB. 1979, A note on optimal inventory management under inflation. Naval Research Logistics. Q., 26:161–165. Dey J.K., Mondal S.K., Matti M., 2008, Two shortage inventory problem with dynamic demand and interval valued lead time over finite time horizon under inflation and time-value of money. Europian Journal of Operational Research, 185:170–194. Mirzazadeh A., Seyed-Esfehani M.M., Fatemi-Ghomi S.M.T., 2009, An inventory model under uncertain inflationary conditions, finite production rate and inflation-dependent demand rate for deteriorating items with shortages, International Journal of Systems Science 40: 21–31. Yang M.F., 2010 Supply chain integrated inventory model with present value and dependent crashing cost is polynomial. Mathematical and Computer Modeling 51: 802-80. Mirzazadeh A., 2010, Effects of variable inflationary conditions on an inventory model with inflation-proportional demand rate, Journal of Applied Sciences 10: 551–557. Jaggi C.K., Khanna A., Verma P., 2011, Two-warehouse partial backlogging inventory model for deteriorating items with linear trend in demand under inflationary conditions, International Journal of Systems Science. 42: 1185–1196. Roy T., Chaudhuri K.S., 2011. A finite time horizon EOQ model with ramp type demand under inflation and time-discounting, International Journal of Operational Research, 11(1), 100-118. Taheri-Tolgari J, Mirzazadeh A, Jolai F. 2012, An inventory model for imperfect items under inflationary conditions with considering inspection errors. Comput. Math. Appl.;63:1007–1019. Guria, A., Das, B., Mondal, S., Maiti, M. 2013. Inventory policy for an item with inflation induced purchasing price, selling price and demand with immediate part payment. Applied Mathematical Modelling, 37 (1-2), 240-257. Singh S.R., Sharma S., 2013 An integrated model with variable production and demand rate under inflation. Procedia Technology 10:381 – 391. Taleizadeh A.A., Nematollahi M., 2014, An inventory control problem for deteriorating items with back-ordering and financial considerations. Applied Mathematical Modelling 38:93–109. Goyal, S.K., 1985. EOQ under conditions of permissible delay in payments. Journal of the Operational Research Society 36, 335–338. Aggarwal, S.P., Jaggi, C.K., 1995. Ordering policies of deteriorating items under permissible delay in payments. Journal of the Operational Research Society 46, 658–662. Salameh, M.K., Abboud, N.E., EI-Kassar, A.N., Ghataas, R.E., 2003. Continuous review inventory model with delay in payments. International Journal of Production Economics 85, 91–95. Ouyang L.Y., Wu K.S., Yang C.T., 2006, A study on an inventory model for non-instantaneous deteriorating items with permissible delay in payments. Computer and Industrial Engineering, 51: 637–651. S. Sana, K.S. Chaudhuri, 2008, A deterministic EOQ model with delays in payments and price-discount offers, European Journal of Operational Research. 184: 509–533. Liao JJ., 2008, An EOQ model with non-instantaneous receipt and exponentially deteriorating items under two-level trade credit. International Journal of Production Economics 113,852–861. Chung K.J., Liao JJ. 2009. The optimal ordering policy of the EOQ model under trade credit depending on the ordering quantity from the DCF approach. European Journal of Operational Research 196: 563–568. Geetha K.V., Uthayakumar R., 2010. Economic design of an inventory policy for non-instantaneous deteriorating items under permissible delay in payments. Journal of Computational and Applied Mathematics 233: 2492-2505. Sarkar B., 2012, An EOQ model with delay in payments and time varying deterioration rate. Mathematical and Computer Modeling 55:367–377. Ouyang L.Y., Chang C.T., Shum P., 2012, The EOQ with defective items and partially permissible delay in payments linked to order quantity derived algebraically, Central Europian Journal of Operations Research. 20 (1): 141–160. Taleizadeh A.A., Pentico D.W., Jabalameli M.S., Aryanezhad M., 2013, An EOQ model with partial delayed payment and partial backordering. Omega 41: 354–368. Chen S.C., Cárdenas-Barrón L.E., Jinn-Tsair Teng J.T., 2013, Retailer’s economic order quantity when the supplier offers conditionally permissible delay in payments link to order quantity. International journal of production Economics. 155:284-291. Bhuniaa A.K., Jaggi C.K., Sharmaa A., Sharma R., 2014. A two-warehouse inventory model for deteriorating items under permissible delay in payment with partial backlogging. Applied Mathematics and Computation 232: 1125–1137. Porteus E., 1986. Optimal lot sizing, process quality improvement, and setup cost reduction. Operations Research 34: 137–144. Rosenblatt M.J., Lee H.L., 1986. Economic production cycles with imperfect production processes. IIE Transactions 18, 48–55. Cheng C.E., 1991. An economic order quantity model with demand-dependent unit production cost and imperfect production processes. IIE Transactions 23(1) 23–28. Chan W.M., Ibrahim R.N., Lochert P.B., 2003. A new EPQ model: integrating lower pricing, rework and reject situations. Production Planning and Control 14 (7), 588–595. Liao G.L., 2007. Optimal production correction and maintenance policy for imperfect process. European Journal of Operational Research 182 (3), 1140–1149. Jaber M.Y., Bonney M., Moualek I., 2009. An economic order quantity model for an imperfect production process with entropy cost. International Journal of Production Economics, 118, 26–33. Khan M., Jaber M.Y., Bonney M., 2011. An economic order quantity (EOQ) for items with imperfect quality and inspection errors. International Journal of Production Economics 133: 113–118. Chung K.J., 2013, The EOQ model with defective items and partially permissible delay in payments linked to order quantity derived analytically in the supply chain management. Applied Mathematical Modeling 37: 2317–2326. Hsu J.T., Hsu L.F., 2013. An EOQ model with imperfect quality items, inspection errors, shortage backordering, and sales returns. International Journal of Production Economics 143: 162–170. Moussawi-Haidar L., Salameh M., Nasr W. 2014. Effect of deterioration on the instantaneous replenishment model with imperfect quality items. Applied Mathematical Modeling, 38(24): 5956-5966.